The Throne of the Four Winds is a 10 and 25 man raid instance introduced into the game at the release of World of Warcraft: Cataclysm. The instance is located in the Southwest of Uldum, and is only accessible by flying mount. Together with Blacking Descent and Bastion of Twilight, it is part of the first raiding tier of the expansion. 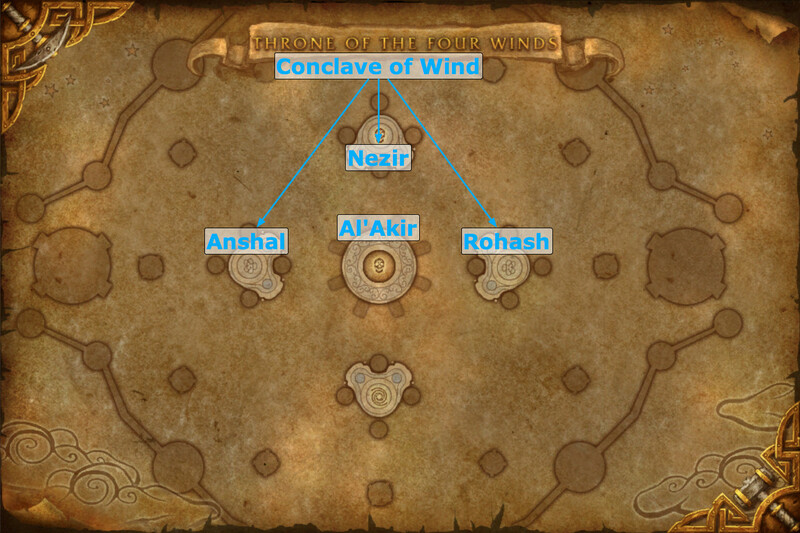 The Throne of the Four Winds houses only two boss encounters, both of which are available on normal and heroic difficulty. Both of the encounters in the instance take place on the platforms which can be seen upon entering. It is worth mentioning that there are no trash mobs of any sort in this instance. The first boss encounter of the instance, the Conclave of Winds, is a council type encounter which takes place on multiple platforms simultaneously. It is not a gear check, but rather an encounter which tests your raid's ability to work in smaller teams while keeping track of everything else that is ongoing. Once the Conclave of Winds is defeated, your raid will be able to engage Al'Akir, the final boss of the raid, who is located on his own platform in the center of the instance. The encounter against Al'Akir is a distinct step up in difficulty from most of the other encounters in this tier of raiding, and it will test each aspect of your raid's ability: proper positioning and movement, appropriate levels of DPS and healing output as well as good on-the-move reactivity.